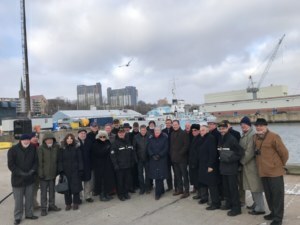 Members and supporters of HMCS Sackville gathered in HMC Dockyard, Halifax Jan 26 to welcome the announcement by Treasury Board President Scott Brison and Dartmouth-Cole Harbour MP Darren Fisher, on behalf of Defence Minister Harjit Sajjan, that the Government of Canada will contribute up to $3.5 million to the Canadian Naval Memorial Trust (CNMT) for extensive repairs to Sackville. 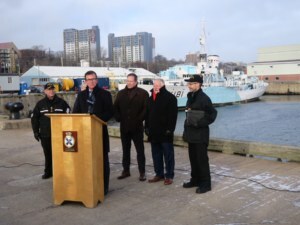 Also attending the announcement were Nova Scotia MPs Bernadette Jordan and Darrell Samson; Rear Admiral Craig Baines, Commander Maritime Forces Atlantic and other naval and civilian officials. Sackville will enter a docking work period lasting approximately three months with most of the work expected to be completed at the Fleet Maintenance Facility Cape Scott using the dockyard synchrolift. A major undertaking will be inspection and repair of the hull (replacing steel where required), other repairs and maintenance. Under the contribution agreement, CNMT and DND will also develop a long-term plan for the preservation of HMCS Sackville which was designated Canada’s Naval Memorial in 1985 and a National Historic Site in 1988. Sackville was commissioned in Saint John, N.B in December 1941 and named after the Town of Sackville, NB. She proudly carries her Battle of the Atlantic honours. Sackville is owned, maintained and operated by the volunteer CNMT on behalf of all Canadians. Commander (ret’d) Wendall Brown, Chair of the CNMT and the Board of Directors have actively pursued discussions with defence and civilian officials in the past year seeking support for required repairs and the long-term preservation of the last of the 123 corvettes to serve in the RCN during the Second World War.